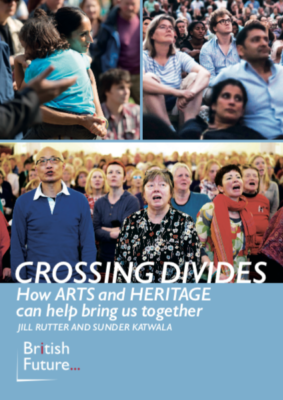 Crossing Divides: How arts and heritage can bring us together looks at the divides in British society and the role that the arts can play in bridging them. It explores in depth the 14-18 NOW arts programme for the First World War centenary, which had broad reach and resonance across different social groups. The authors ask whether this kind of reach and engagement can only be achieved on major national anniversaries and what broader lessons the centenary programme offers to those involved in the arts. The report makes recommendations to the Government, funders and the arts and heritage sectors, including that they should shift focus away from London and extend the reach of the arts out of major cities to towns across the UK. Research included discussions with artists and partner organisations in the four national capitals of the UK, with public consultations in Sunderland, Folkestone, Glasgow and Leicester, plus nationally-representative polling by ICM. The Crossing Divides report was commissioned by 14-18 NOW by public tender. The views and recommendations in the report are solely those of the authors and of British Future, which conducted the research. British Future maintains full editorial independence from 14-18 NOW. "RT @JoJohnsonUK: Good to see our new clause on international students (published today) already has cross-party backing of 9 Select Committ…"
"RT @sundersays: No public pressure or interest in cutting international student numbers, but a very broad social, political & cross-referen…"
"New proposals to boost UK universities by attracting more international students, as @JoJohnsonUK @PaulBlomfieldMP… https://t.co/7GgwSmmP6a"
"RT @steveballinger: 'I’m proud to be English, let’s take patriotism back from the far-Right' says fellow Englishman and #NFFC fan @mattford…"